Today's weather forecast promised rain, but the sun was out first thing so I slung my things together and headed out round the long river loop. It was blustery this morning and the river was swollen, so I feared that activity would be limited; I was right. 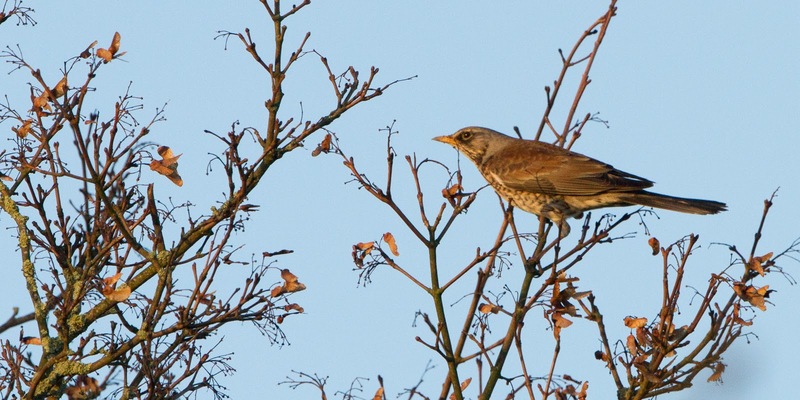 Winter thrushes continue to be present in huge flocks, but the odd one chooses a solitary existence. Other 'highlights' were little egret (which is almost guaranteed these days), goosander and teal. Just before the end of my walk, I decided to try out a new area of the patch, Thrintoft Ings. As its name suggests, this was once wet meadow, but now the pressures of agriculture have criss-crossed it with sedgy drains and dykes. I soon disturbed woodcock (only my second ever sighting locally, and the second in two weeks!) but like everywhere else, there were few birds about. However, it wasn't a fruitless venture; I discovered some cracking habitat to check out in the Spring for sedge warbler, water rail and other patch exotics. As I set out on a trip out with the family over lunchtime, I checked in with neighbouring patch rival Nick Morgan to see if he was having a dry a time as I was. He wasn't, with both peregrine and merlin sighted that morning, with merlin heading my way! Alas, as ever when Nick points out something special, I'm never close to home! Merlin is a bird that (despite my hours spent on the moors looking for reptiles) has eluded me my whole life. With the incentive of a tiny chance of catching up with a lifer, I headed out as soon as I was done with family business. I set out on foot for the ox-bow lake; I figured the huge finch flock would be a draw to a small falcon. 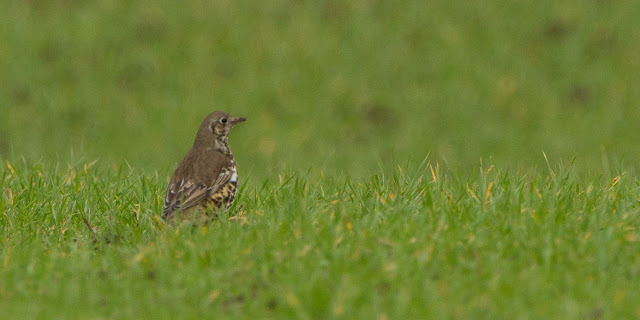 On the way, I came across yet another pair of mistle thrushes. At the south of the lake, the finches were abundant again. Interestingly, they were about 40% chaffinches, so while the flock remains at a size fluctuating between 100-200, the composition of species seems to change quite regularly. It had started off as a large flock of redpoll, quadrupled in size with linnet and now most of the linnet and all of the redpoll have gone. I sat quietly and watched hopefully for a falcon. The birds were agitated more than usual and rarely alighted, swirling around the stubble field in groups of 30 or 40; I was sure that this indicated the presence of a predator. After 20 minutes I got up and moved further along the hedgerow to look over the crest of the hill towards the river. 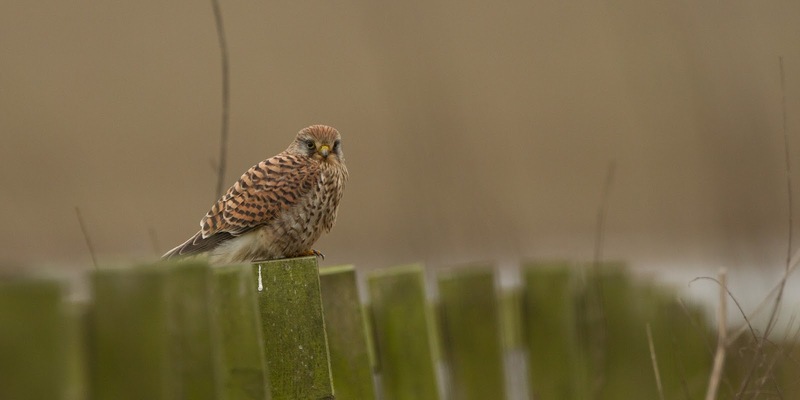 As I approached the gate between fields, I disturbed a kestrel feeding off carrion; a rabbit I presume was killed by the buzzard that frequents the area around the lake. I'd not witnessed kestrels feeding on carrion before and she seemed quite keen to carry on feeding, refusing to fly far and watching me from a nearby post. As I stood watching her, a male then female sparrowhawk lunged through the finches without success. I took a route home across the fields and came across a redshank feeding in the water-filled gunnels left by a tractor. A hundred yards later, I kicked up a woodpecker from the ground... I couldn't make out it's size or colour as it flew towards the sun; it settled in one of the trees around the ox-bow lake some 300yards away. I will investigate further tomorrow; its alarm call was VERY lesser spotted.